I love this time of year when it’s time to harvest the garden or hit up the local farmer’s market. 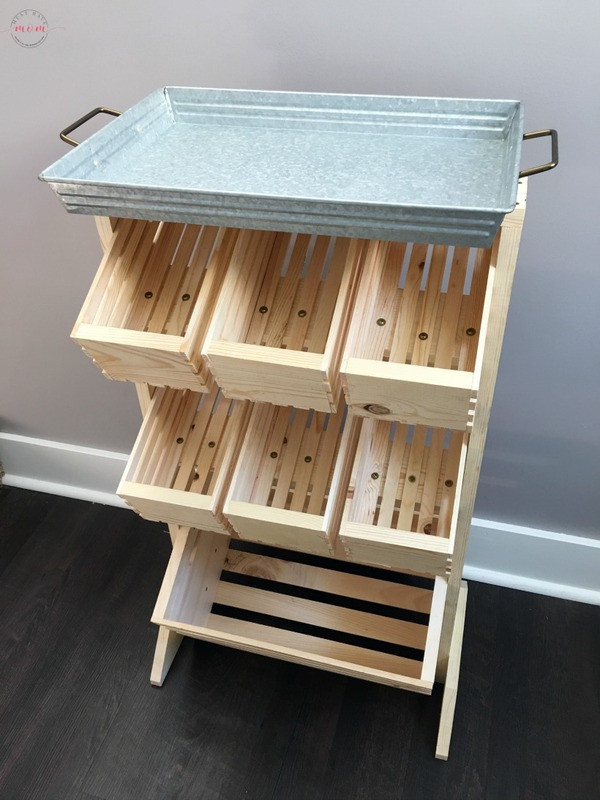 There is SO much fresh produce and this DIY produce stand is the perfect place to store your produce and I’ll also show you my favorite way to eat the vegetables from the farmer’s market! 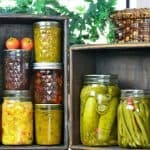 The harvest this time of year is plentiful and I find that the wide variety of fruits and vegetables that summer and fall produce leaves my counters cluttered with produce. 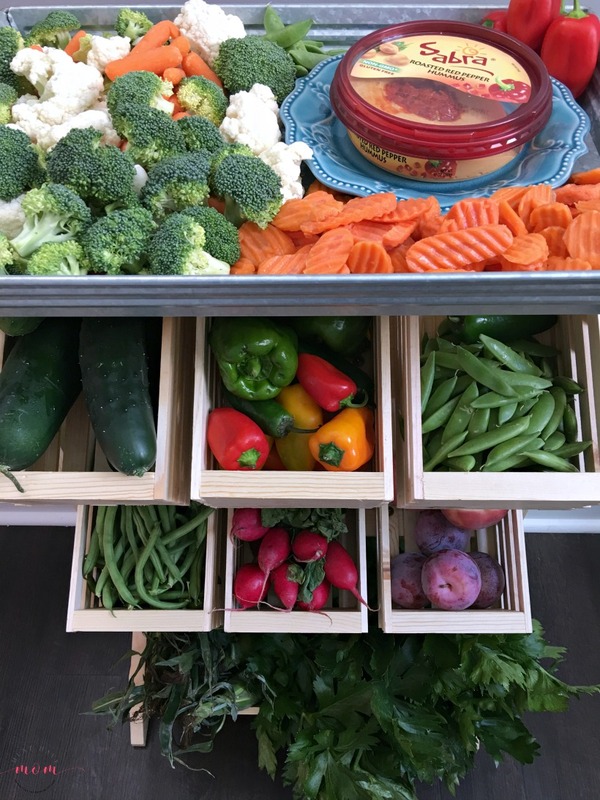 I hate having all of my counter space cluttered up by produce, but I wanted an easy way to store it where it would be easily accessible and not forgotten. The last thing I wanted to do was to put it away and have it be forgotten and not eaten. 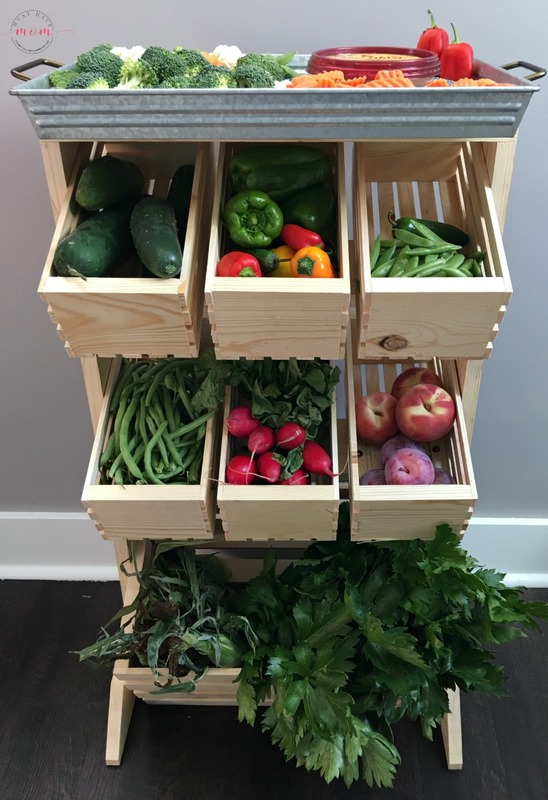 This DIY produce stand was exactly what I needed and solved all of these problems. 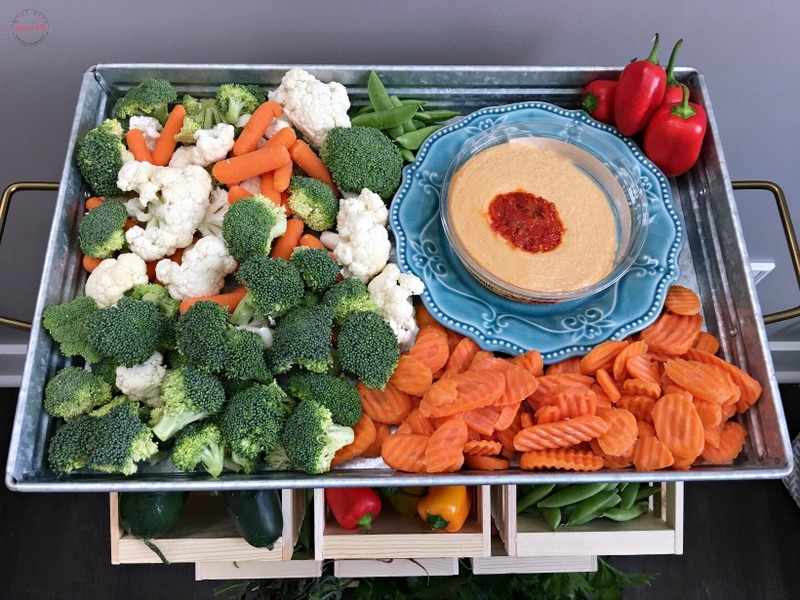 The DIY produce stand also makes it really easy to serve up a farmer’s market vegetable platter with my favorite Sabra Roasted Red Pepper Hummus. It’s my favorite way to eat all those delicious vegetables and make sure they don’t go to waste. 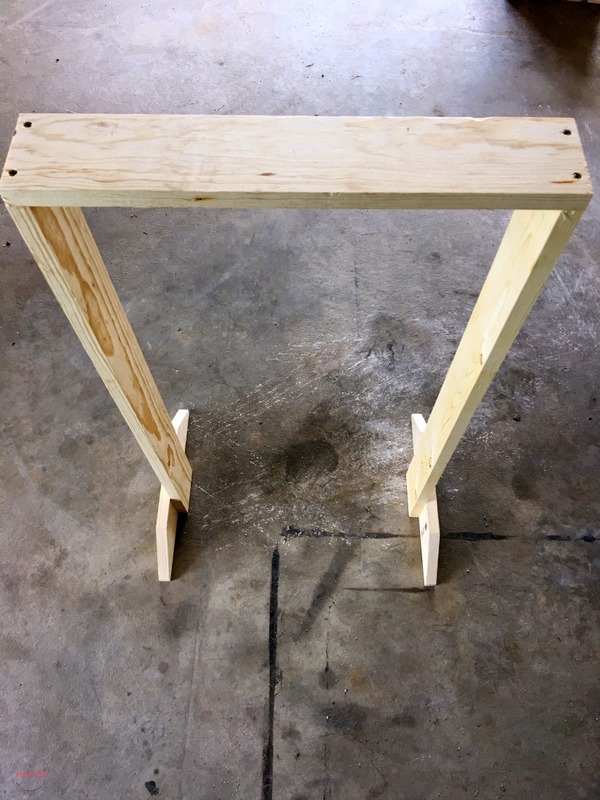 Want to make your own produce stand? I’ll show you exactly how to do it! 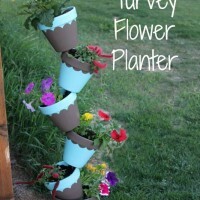 It’s a really quick and easy project. First, pick up some wood baskets. I found these at Walmart in the craft section. I chose to use one larger basket and six smaller baskets. You can use any combination of sizes as long as they are the same width. 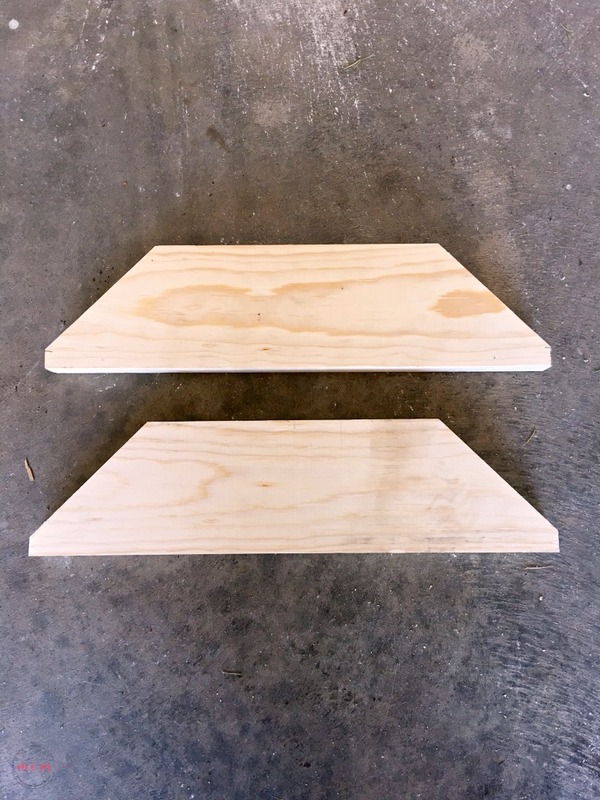 Next, you’ll need two 8′ 1″x4″ pieces of pine. We measured the width of the area we were going to put the produce stand. We didn’t want it sticking out past the cupboards so we made the feet of the stand the same width as our cabinets. I suggest you do the same measurements for the length of each of the feet. Then cut at an angle down and make a straight cut to shave off the point. Next, measure the height you’ll want for the baskets you chose. I went with a countertop height and that worked with my baskets. You can customize this to whatever height you choose. Mine sits nicely below the light switch. 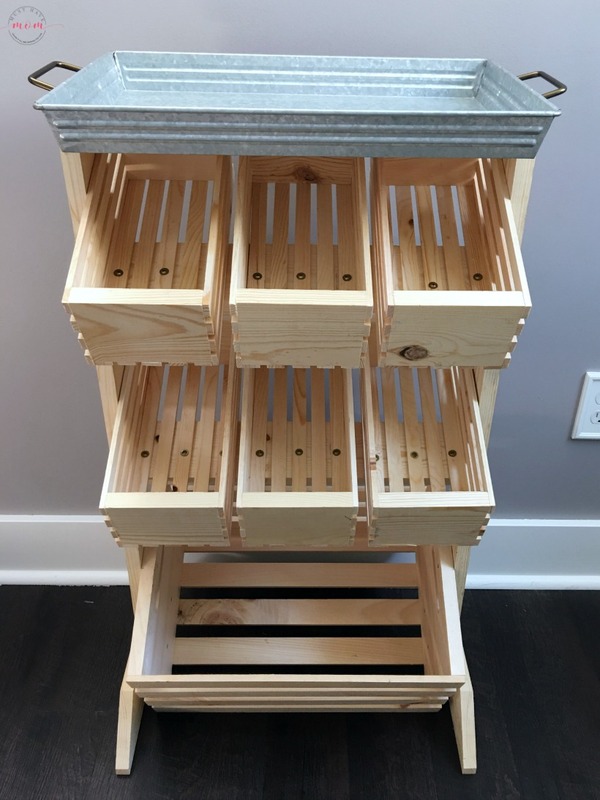 Take that into account as well for wherever you’ll be placing your produce stand. You’ll need two feet and two legs, one for each side. Attach a foot piece onto each leg by screwing it into place. 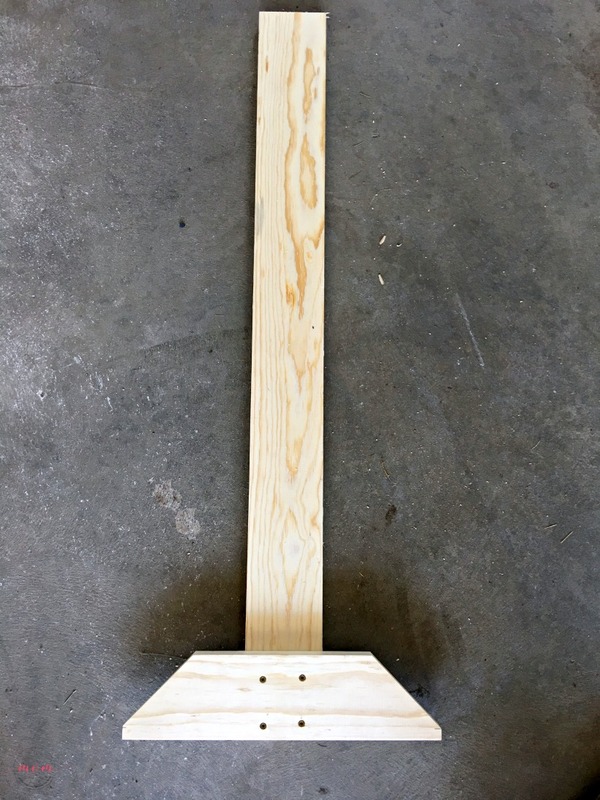 I also used wood glue for added stability. 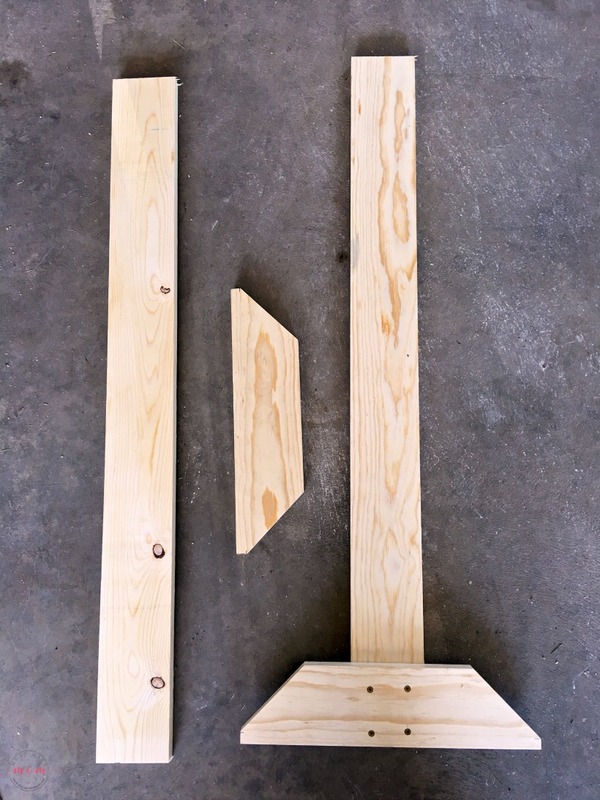 Now, measure the width of your baskets and create a top piece to complete your frame. 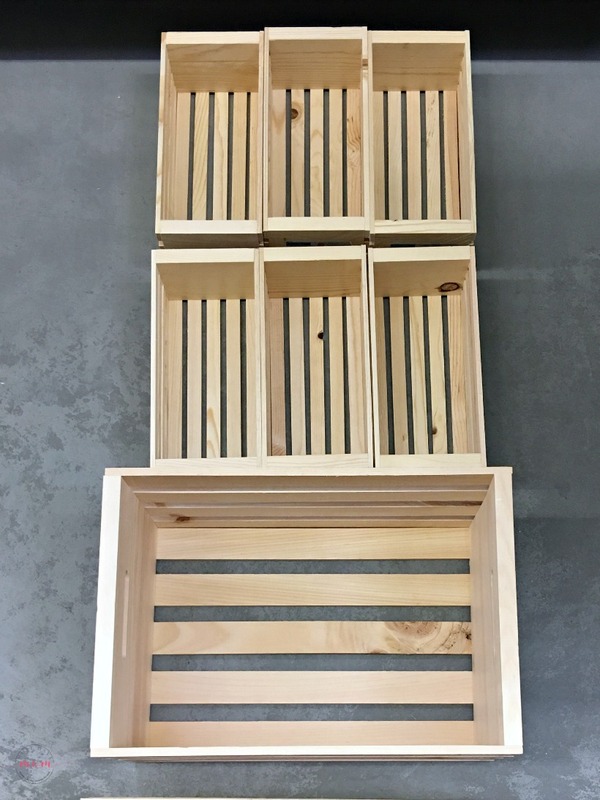 Be sure to make it wide enough so that your baskets fit INSIDE the frame. Then, use wood glue and screws to attach the baskets to the frame. Choose your desired angle for the baskets and ensure all of the baskets you chose will fit. We tilted them forward and since my smaller baskets were slightly narrower than the large basket, we added a cross brace underneath them and screwed them in place, spacing them apart equally. This ensured they would fit with the larger basket underneath them. I then added a galvanized metal tray (found at Walmart) to the top. You can choose to attach it permanently or just set it in place. I also considered putting a piece of butcher block on top but I like the look of the mixed mediums better. Now fill your completed produce stand with your fresh farmer’s market fruits and vegetables! 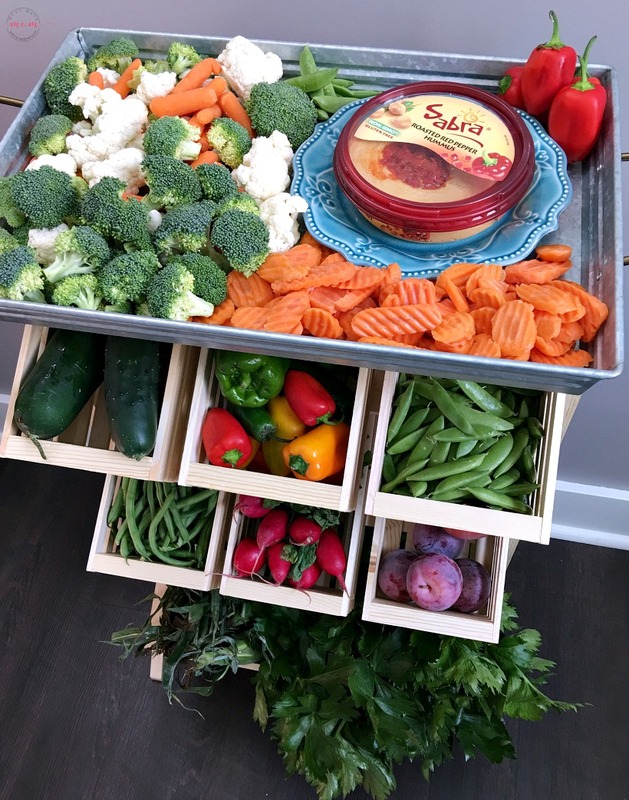 I love the completed look and I really love having the fresh produce so readily accessible. My kids literally walk past it and grab peas and eat them. We eat more produce with it right in front of our eyes and less goes to waste. 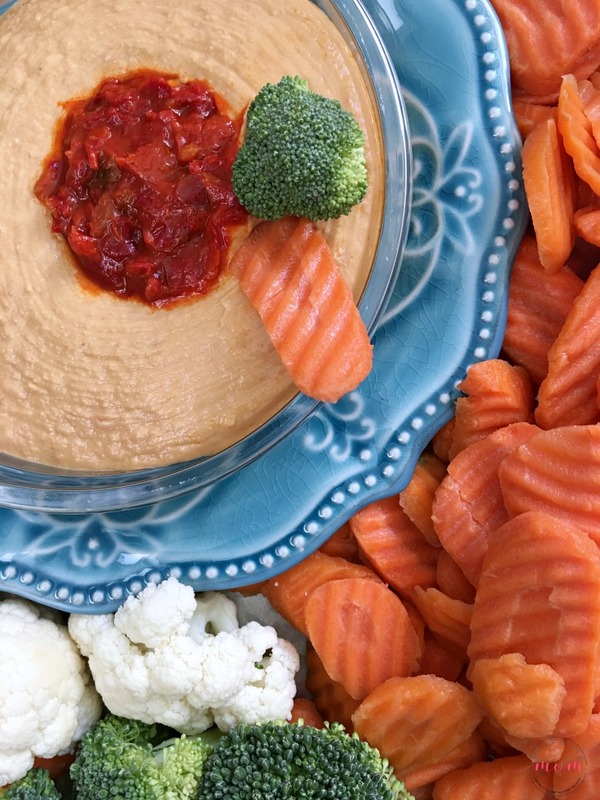 I love eating farmer’s market veggies with hummus. 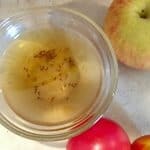 It’s a quick and easy snack that is healthy and easy to prepare. 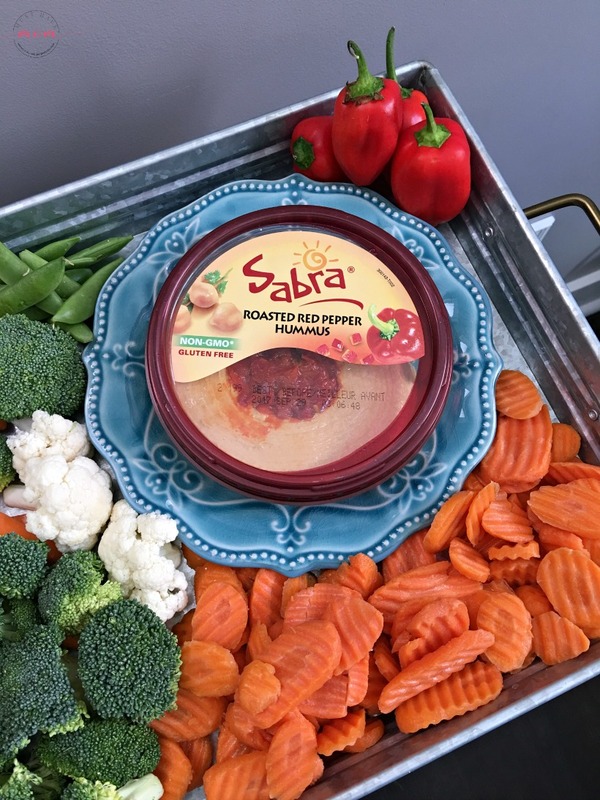 You can find the Sabra Roasted Red Pepper Hummus in the deli section at Walmart. It is Non-GMO and gluten free! 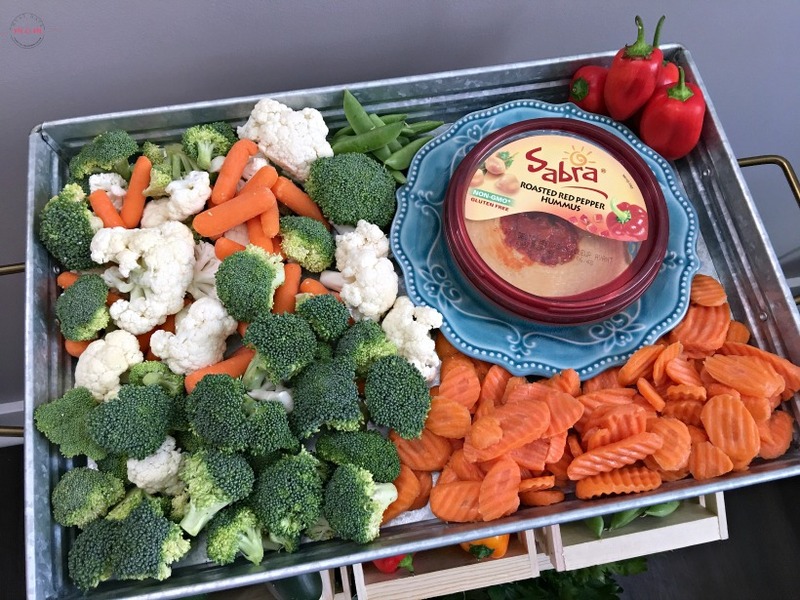 I love to serve Sabra Hummus with farmer’s market veggies like carrots, broccoli, cauliflower, radishes, peas, celery, cucumbers, and peppers. 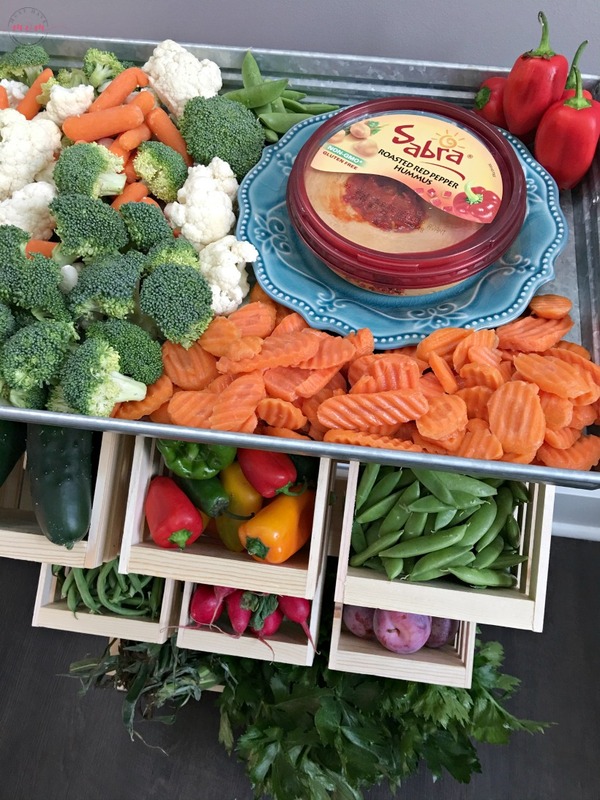 The best part is, there is no reason to dirty any extra dishes because you can serve Sabra Hummus right out of the container! 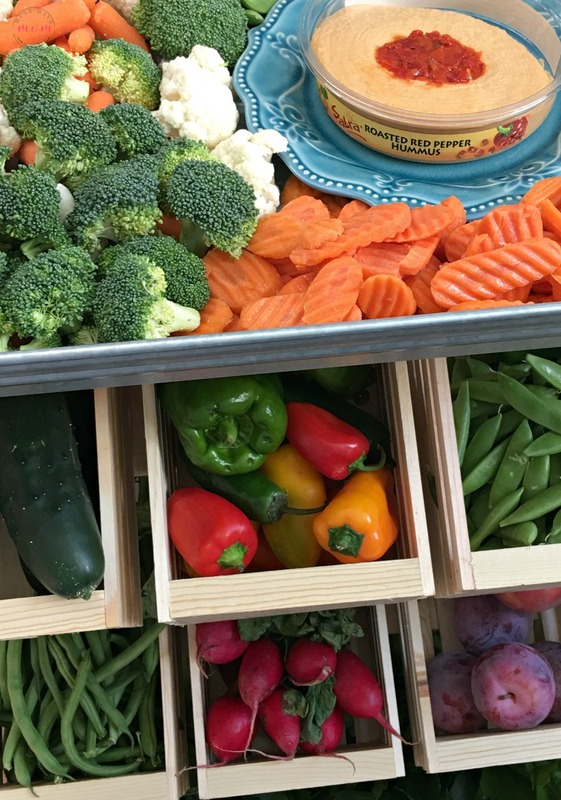 Pile up the veggies around the container and you’ve got a beautiful and EASY farmer’s market veggie tray. It’s beautiful enough to serve to guests and easy enough to eat as a healthy snack every day! 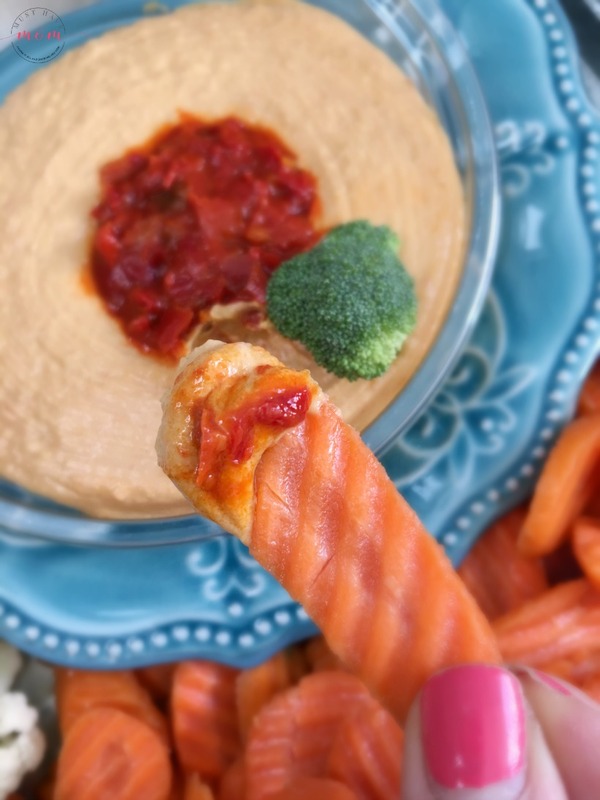 Kids especially love to dip things so adding hummus to my veggie trays also ensures my kids hop on board and eat their veggies! 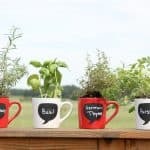 Visit Walmart Farmer’s Market for more recipe ideas. Check out your local Walmart for an in-store demo 8/26! « Back To School Organization Tips That Actually Work!